Opis: The spot near the bottom is an image of an unusual type of object: a brown dwarf. A brown dwarf is sometimes called a "failed star" because it does not have enough mass to shine by nuclear fusion. A brown dwarf is more massive than a planet, though, and thought to have formed through stellar-like nebular condensation. Brown dwarfs and planets are likely quite abundant, but usually difficult to see in the glare of brighter stars they orbit. New techniques, such as using coronagraphic masks to block the light of the bright star, are allowing the detection of these faint stellar companions. 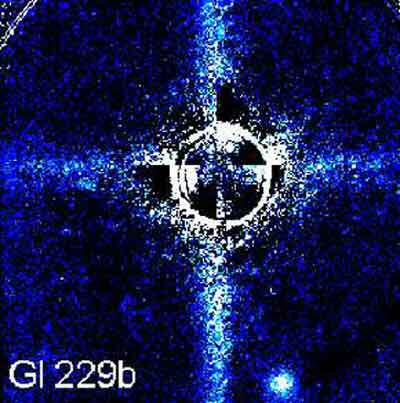 Above, much of the bright light of central Gliese 229A has been blocked and digitally subtracted, leaving the clearest image yet of Gliese 229B. Perfecting techniques like this increases ability to detect still dimmer Earth-type planets orbiting nearby stars.